If there are arms dealers involved, see you next census! In 2008, the UK government awarded Lockheed Martin (the world’s largest arms company) a £150 million contract to help run the census. Lockheed Martin has a ruthless and blood-soaked history. They are best-known for building cluster bombs and our Trident nuclear weapons system, and their arms sales to Bahrain and other repressive regimes are an ongoing controversy. Granting the contract funnels our money into conflict and the suppression of legitimate protest, and gives credibility to a company that deserves none. This credibility is in turn used to gain the contract for more censuses. A number of different concerns have been raised with the 2011 census. The census is promoted as a way for the government to provide better and more appropriate services. Instead, census data in the past has been used to justify fewer services, not more — particularly worrying at a time when the government is taking a wrecking ball to public services. In addition, the UK census asks limited questions about disability and none about income, rendering swathes of the population invisible in official statistics. 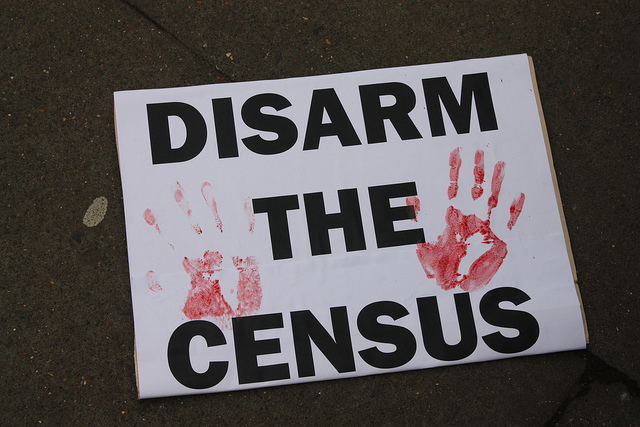 Count Me Out is raising awareness about the arms trade’s involvement in the 2011 census, and bringing together different individuals and groups across the UK taking action against the census. From boycotts to census parties, writing to representatives to holding demonstrations, the key is not to let Lockheed get quietly away with a whitewashed reputation and £150 million cheque. Arms company running the census? Count me out.